Not only the [people of the] world would pursue periya mudhaliyAr’s (nAthamunigaL) gyAnam (knowledge) etc; due to the approval of parASara rishi, who is a renowned vaidhika scholar of the principles put-forth by nAthamunigaL, the authenticity of these principles is explained. Both SrI parASara bhagavAn and nAthamunigaL have a similarity in their nature. parASara rishi’s attachment towards krishNa and his magnanimity [of presenting these important principles, through SrIvishNu purANam] towards the world, are found in nAthamunigaL too. Due to these reasons, ALavandhAr salutes SrI parASara bhagavAn. My salutations to that magnanimous parASara rishi who is best among rishis, who mercifully gave SrIvishNu purANam, gem (best) among purANams which clearly explains the three entities namely chith (sentient entities), achith (insentient entities) and ISwara (God), their nature, the pleasures (of this material realm), mOksham (liberation), the means for pleasure and liberation, and the goal reached by the jIvAthmAs, as they are (truthfully). thathvEna – Explaining the principles that are to be known, as they are. chith – gyAthA (knower). SrIvishNu purANam 2.13.71 “AthmA SudhdhO’ksharaSSAnthO nirguNa: prakruthE: para: | pravrudhyapachayau nAsya EkasyAkhilajandhushu ||” (AthmA is free from blemishes such as karma; indestructible; devoid of hunger, thirst etc; free from three qualities of sathva, rajas and thamas; greater than matter; for the AthmA who remains the same in all creatures, there is neither expansion nor contraction). nirguNa means being free from [mixed mode of] sathva, rajas and thamas [he is rather, Sudhdha sathva]; EkasyAkhilajandhushu means AthmA remaining the same while accepting bodies of dhEva (celestial), manushya (human), thiryak (animal) and sthAvara (plant). Spoken by bhagavAn himself in SrI bhagavath gIthA 5.19 “nirdhOsham hi samam brahma” (free from defect (of being related to worldly matters) and (due to that) AthmA which is equal, is known as brahma (AthmA)) and in SrI bhagavath gIthA 5.18 “paNdithAs samadharSina:” (The wise see equally). achith – achEthana (matter – insentient entities). manthirka upanishath “vikArajananIm agyAm” (one that causes changes, devoid of knowledge). parASara too explains this in SrIvishNu purANam 1.2.20 and 1.2.21 “thriguNam thajjagadhyOniranAdhiprabhavApyayam | akshayyan …” (imperishable; has sathva, rajas and thamas qualities; that which has no cause, birth and death, is the cause for the world). ISwara – the controller of both chith and achith; SrIvishNu purANam 6.4.40 “paramAthmA cha sarvEShmAdhAra: paramESwara: | vishNunAmA sa vEdhEshu vEdhAnthEshu cha gIyathE ||” (paramAthmA is the abode for everyone and is the controller for everyone. He is glorified as vishNu in vEdham and vEdhAntham). SrIvishNu purANam 1.2.10 and 1.2.12 “para: parANAm parama: paramAthmAthmasamsthitha: | rUpavarNAdhinirdhESaviSEshaNavivarjitha: || sarvathrAsau samasthancha vasathyathrEthi vai yatha: | thathassa vAsudhEvEthi vidhvadhbhi: paripatyathE ||” (paramAthma who is greater than the greats, one who lacks anyone greater than him, one who is the abode for himself – is devoid of attributes such as (mundane) form, color etc, name. He is known by the scholars as vAsudhEva) and so on. thath svabhAva – Their nature; SrIvishNu purANam 2.7.29 “pradhAnancha pumAmSchaiva sarvabhUthAthmabhUthayA | vishNuSakthyA mahAbudhdhE vruthau samSrayadharmiNau ||” (Oh most intelligent! prakruthi and purusha who are together, all creatures are pervaded by the power of vishNu who is the soul [of every entity]” and so on. bhOga – Sabdha (sound) etc [sparSa (touch), rUpa (vision), rasa (taste), gandha (smell)] which are enjoyed by all badhdha chEthana (bound souls) starting from the top-most brahmA to the lowest ant, based on their karma. apavarga – mOksha (liberation). For the chEthanas who are frightened by seeing the defects such as insignificance and impermanence, of the worldly pleasures of Sabdha (sound) etc., there are two types of liberation – AthmaprApthi (self-realisation) where one is freed from all worldly sorrows and bhagavathprApthi (service to bhagavAn) which is full of exclusive bliss. This is explained by parASara in SrIvishNu purANam 1.6.38 “yOginAmamrutham sthAnam svAthmasanthOshakAriNAm” (eternal place for the yOgis who are inclined towards enjoying self only). SrIvishNu purANam 1.18.22 “thadhasya thrividhasyApi dhu:khajAthasya … bhEshajam bhagavath prApthi:” (Eternally engaged in blissful service of bhagavAn is the medicine for my three types of sorrows) and so on. thadhupAya gathI: – the different means to attain worldly pleasure and liberation. nithya naimiththika karmAnushtAnam (performing all daily and specific/occasional routines which are ordained in SAsthram for each individual) is the means for worldly pleasure; performing karma gyAna yOga etc with their ancillary aspects is the means for AthmaprApthi (self enjoyment); bhakthi yOga along with karma yOga and gyAna yOga, and prapaththi (surrender) are the means for bhagavath prApthi. udhAra: – Instead of expecting the samsAris (mundane people) to request him [to give good advice] or to get something in return [for his advice], looking only at their pathetic situation [of suffering in this material realm], favoured them [with these principles] like a cloud which cannot resist raining. sandharSayan – without any doubts and defects, explaining them clearly. niramimItha – He revealed the inaccessible meanings of vEdham in a short treatise as said in nAnmugan thiruvanthAdhi 1 “anthAdhi mElittu aRiviththEn Azh poruLai” (I revealed the deep knowledge [of vEdham] in this nAnmugan thiruvanthAdhi prabandham which is in anthAdhi style (last word of one pAsuram is part of the first word of the next pAsuram). purANa rathnam – As said in narasimha purANam 3.33 “sargaScha prathisargaScha vamSa manvantharANi cha | vamSAnucharitham chaiva purANam pancha lakshaNam ||” (A purANam is that which has the following crucial features – srushti (details about creation), praLayam (details about deluge), vamSam (the various heritages), manvantharam (details about manus) and vamSAnucharitham (the branches and various historical aspects)) – this SrIvishNu purANam is a grantham which matches such features fully. Also explained as per the literal meaning of purANam which is “purApi navam purANam” – one which is ancient, yet it looks new every time one looks at it; that is, the enjoyability of the grantham can never be destroyed. rathnam – Four qualities are explained – revealing the principles clearly, being compact, being dependable while in danger and the bearers of the purANam are well recognized [these qualities apply to both a precious gem and SrIvishNu purANam]. 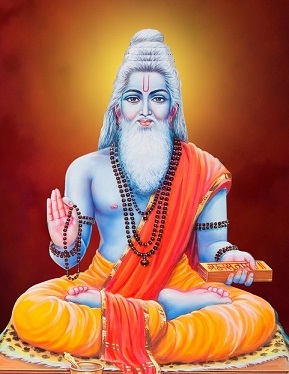 muniuvarAya – being blessed by great sages like vaSishta, pulasthya et al and thus having their greatness; also explained as, being pursued/honoured by great sages. parASarAya – para indicates others such as bAhya (those who reject vEdhas) and kudhrushti (those who accept vEdhas but misinterpret them); he tortured them with the arrows of authentic sacred texts and established the vaidhika system; also explained as, one who is victorious over rajas and thamas qualities by his control over senses. This entry was posted in Other, sthOthra rathnam on December 17, 2016 by Sarathy Thothathri.